The Diverse Bard explores how Shakespeare has been adapted by artists born on the margins of the Empire, and how actors of Asian and African- Caribbean origin are being cast by white mainstream directors. It examines how notions of 'race' define the contemporary British experience, including the demands of traditional theatre, and it looks at both the playtexts themselve and contemporary productions. Editor Delia Jarrett-Macauley assembles classic texts and new scholarship by leading critics and practitioners, to provide the first comprehensive critical and practical analysis of this field. In 1828, when slavery was still legal throughout Britain’s colonies, the African American actor Ira Aldridge became Manager of the Coventry Theatre. 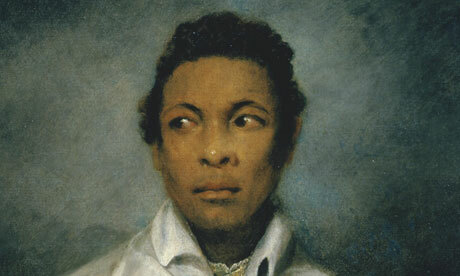 Ira was the first black actor to play Othello. And only two months after he was introduced to West Midlands audiences as ‘A Most Extraordinary Novelty, a Man of Colour’, he was running the theatre. This event honours Ira Aldridge’s amazing achievement with a drama-documentary and a night-time procession to the site of the long-lost playhouse where he and the local community made history. With scenes, speeches and songs from Aldridge’s Coventry season.Featuring leading professional actors alongside performers from Coventry’s youth theatres and community choirs. Presented by Warwick University’s Multicultural Shakespeare Project, the Belgrade Theatre, and supported by Coventry UK City of Culture 2021 Bid. !7th November. B2.Belgrade Theatre Coventry. 7.00 p.m. The Multicultural Shakespeare project was launched in 2012. Since then, isssues of diversity, access and representation have become the centre of a national debate. In the 400th anniversary year of Shakespeare's death we ask: Do we have a multicultural theatre? And can we? 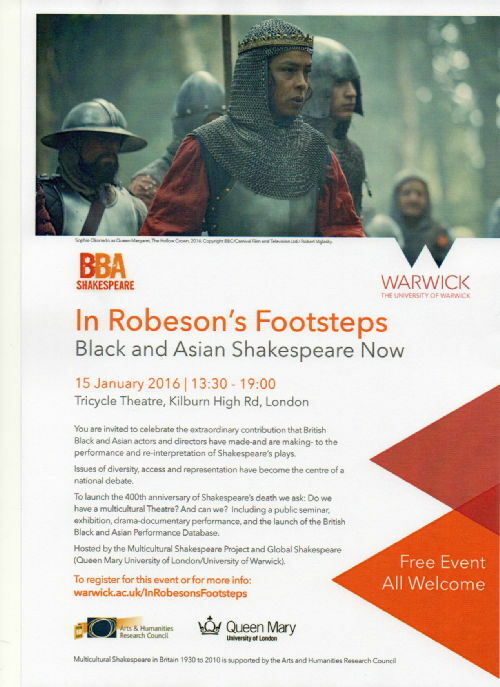 For more information and to book a place visit In Robeson's Footsteps. 'This Island's Mine' - Shakespeare's Communities Today: a public seminar focussing on the connections and differences in contemporary approaches to Shakespeare across cultures. 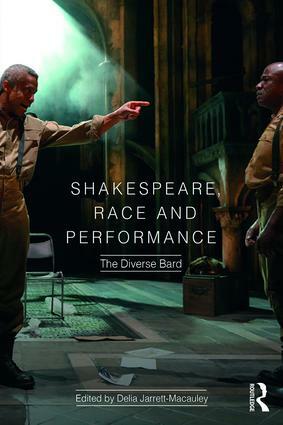 Chaired by Professor Ayanna Thompson of George Washington University, it features research from the Multicultural Shakespeare team including a history of multicultural Shakespeare in Britain and the launch of the British Black and Asian Shakespeare Performance Database. With Professor Tony Howard, Dr. Jami Rogers, Sita Thomas, Professor David Schalkwyk and Dr. Preti Taneja. 'In Robeson's Footsteps' - Material discovered about Paul Robeson and our interviews with actors and directors provide the raw material for a dramatized account of their experiences with Shakespeare, performed by Rakie Ayola, Nicholas Bailey, Simon Manyonda (subject to availability). 'To Tell My Story' - An exhibition mapping British Black and Asian involvement in the performance of UK Shakespeare since 1930. To celebrate the extraordinary contribution that British Black and Asian actors and directors have made - and are making - to the performance and reinterpretation of Shakespeare's plays, the Multicultural Shakespeare project and the Centre for Global Shakespeare are hosting this FREE event.